If you’re as big of a fan of “Hocus Pocus” as we are, then you’ll definitely want to have a witch-themed Halloween party at some point in your life. And since the Sanderson sisters are no longer around to guide us, we’ll give you some help. Here are some go-to-tips for planning the witchiest Halloween party in town! Spooky Decorations! The first thing your guests will notice when they arrive to your party will be the ambiance, so get creative and pull out all the stops when it comes to decorating your space! Every horror movie fan knows all witches center their homes around their most prized possession — the cauldron! Make sure to feature a big “cauldron” (any makeshift one, even a large soup pot will do!) front and center for all eyes to see. Fill the cauldron with any number of things — sweet treats, warm cider, or a hearty stew are all great options. Consider making some spider centerpieces to spread around the scene — simply put some cotton balls, a plastic spider, and light inside a glass jar to create the icky illusion. Disperse brooms around the house for flying — you never know when a guest might need to take off! Treats! It simply isn’t a party if there aren’t some yummy snacks, and your witch-themed extravaganza should be no exception. Trying to come up with unique ideas? Let us help you! Create a “witch’s finger” by dunking some pretzel rods into green icing and letting them cool. Then attach your favorite red candy (either Red Hots or Twizzler nibs are a great option) to the end of the rod to give the appearance of a fingernail! If you’d rather turn half of your dipper pretzels into witch’s brooms, simply attach a cookie to the bottom and you’re all set. A “cup of dirt” is always a yummy dessert option for a witch-themed party and you can put your favorite custards, cakes, and gummies (worms really help sell the theme) all in one jar! Top them off with a mini witch hat and your guests will be over the moon. Costumes! Nothing sells a party like hosts who have gone all out with their costume choices. 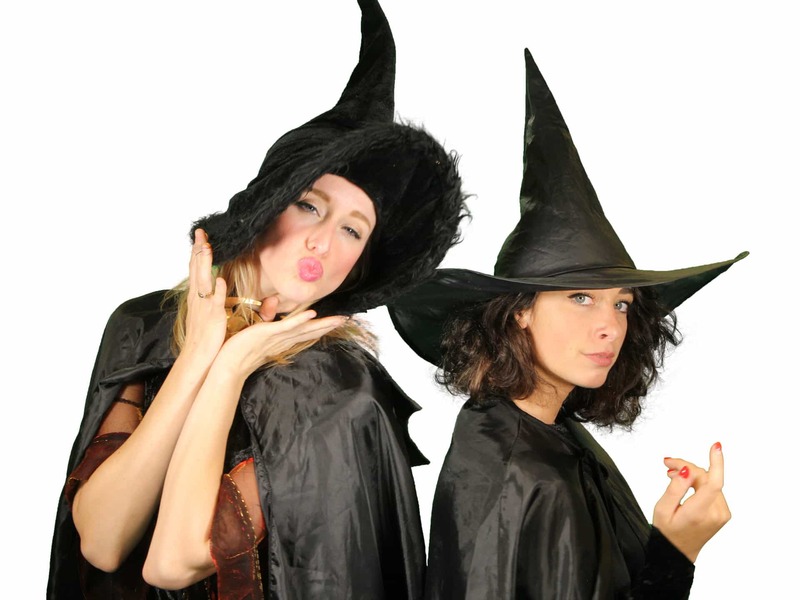 If you’re going to throw a witch-themed party, you’ve got to dress the part! All black head-to-toe garb is essential, and it must be topped off by a big pointy witch hat. If you want to take it a step further, consider getting a fake nose (or even a prosthetic one for the truly dedicated) to attach to your face. Witches aren’t exactly known for their beauty, so go the extra mile and put a big ugly mole on your face to complete the look. Carry around a broom and practice reciting some spells — your guests will love it! Music! Music is essential to getting any party started and a witch-themed Halloween extravaganza calls for a lot of holiday tunes. Some must-haves include “I Put A Spell On You” (any version works, but Bette Midler’s is of course our go-to! ), “Black Magic Woman”, and “Love Potion Number 9” are some of our favorites, but make a playlist that you know you and your guests will love! Movies! Even though you’ve got music playing, it’s still a great touch to have movies playing on your television screens for people to see. Some classics include “Hocus Pocus”, “The Witches”, “The Craft” and “The Witches of Eastwick”, just to name a few. Make sure you keep the volume off, though — you don’t want the sound to jumble with your music playlist! That would just be terrifying. Other than that, have fun! The most important part is that you and your guests have a great time celebrating this haunted holiday. Happy Halloween!